The boy was six years old when he first started playing for the coach. It was the summer between first and second grade and the boy still remembers it to this day. 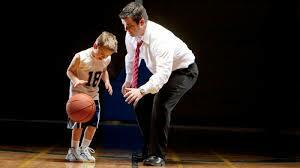 The coach was in his fifties and in his thirty fifthyear ofcoaching young men in the fine art of how to play basketball. But the boy would tell you that being a coach was only a disguise, one of many he wore. He had a knack for talking to kids. He put them at ease from the first word, even though he was six feet two inches tall, broad-shouldered, two-hundred twenty pounds. He was an imposing figure but the children flocked to him. He had been a three-sport athlete in high school: basketball, football and baseball. He probably could have played in college but he went to war right after high school. When he came back from overseas he plied the trade he had learned in the Army, working in electrical construction. This was another persona. He was the lineman for the electric company. The guy who took the neighborhood kids for rides in his bucket truck. The same bucket truck he used to hang a backboard and basket on a telephone pole. While raising a family, he began to mentor some of the neighborhood kids. He started coaching, first baseball, then basketball. He had nine children of his own, six boys and three girls. He often joked he could field his own baseball team. The neighbors respected the coach. They knew that not only were their kids safe with him, they were also learning. And not just learning a game. They were learningvalues andbuilding character. Sportsmanship, teamwork, handling tour emotions and dealing with a loss were all subjects the coachdelved into on a daily basis. And the kids ate it up. They responded to his teaching and developed a brand of basketball that is rarely seen: A truly unselfish team. In 35 years of coaching Catholic League basketball, the coach won thirty-two league titles. He took his young men to the state finals a whopping twelve times, winning eight. More importantly, all but four of his student athletes graduated high school. Most went on to college and a few even played Division One basketball. It turns out that he wasn’t just a coach. He could be a mentor, a teacher, a philosopher and a poet. He could be your bigbrother, your crazy uncle or your stern father, depending on what you needed at the time. Watching the boys, now men, return for his funeral was very emotional. There were different eulogies, but allin all, there was very little talk of sports. Odd for the funeral of a man with his pedigree. Instead there were words like love, family, character and commitment. Words that were to be the real lesson taught by the coach. I know because I saw him with his disguise off. He was my father.